Oh, how quickly the holidays roll around! I can hardly believe that this Thursday is Thanksgiving. I made a quick little card to celebrate. 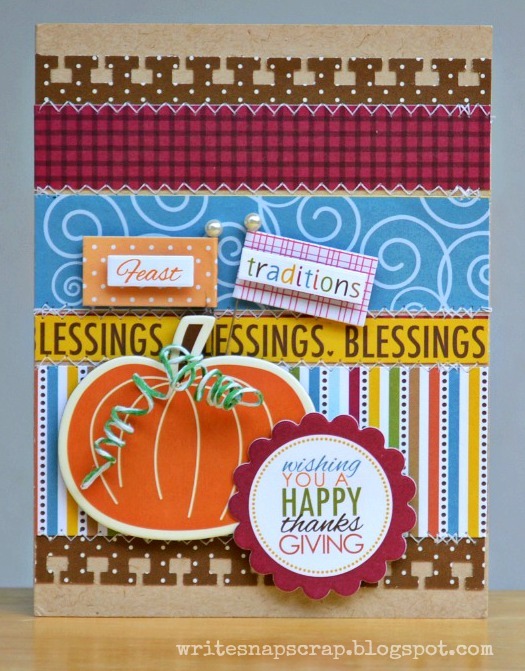 To make this card, I used some scraps from the Bella Blvd Thankful line and a simple design. I stitched the rows of patterned paper across the card, then added chipboard and little pennants. To make the pennants, I added word stickers to some plain Bella flags in my stash. To curl the twine for tendrils on the pumpkin, I wet the twine with a glue medium, then wrapped the twine around a pencil. When the glue was dry, I unwrapped the twine and it sprung back into a curlicue shape. Easy! If you'd like to win some twine, be sure to check out last Saturday's post. I'm giving away 4 colors of holiday twine. Entries close tomorrow night and the winner will be announced here on Wednesday. To my American friends, I hope you have a wonderful Thanksgiving holiday. Thanks so much, everyone, for stopping by. This is BEAUTIFUL!! I loveeeeeeeeeeeee the pumpkin and the stitching!!!! Beautiful design, Izzy! So fun and festive! 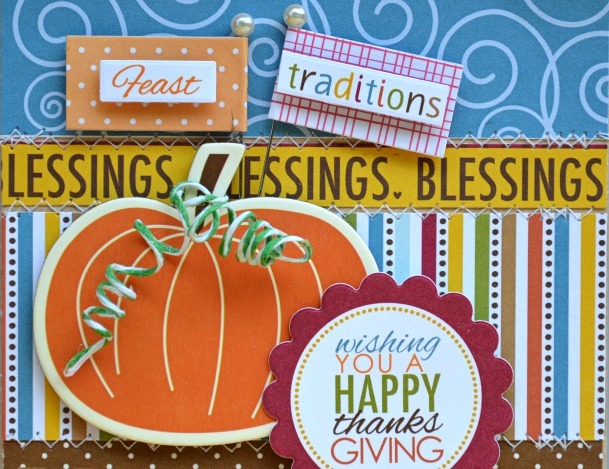 Love the combination of paper and colors on this card!! Looks fantastic!! !